Emperor Charles V was Holy Roman Emperor from 1519 to his abdication in 1556. He was also King of Aragon and Castile as Charles I. This decorative Sword of Carlos V offers superior finish and quality design. This popular Charlemagne decorative sword comes from a group of models representing the swords of leaders and legends from medieval Europe. The Charlemagne sword blade is crafted in polished stainless steel. This popular Charlemagne decorative sword from Armaduras Medievales comes from models representing leaders and legends from medieval Europe. The Charlemagne sword blade is crafted in polished steel with a hilt finished in bronze. 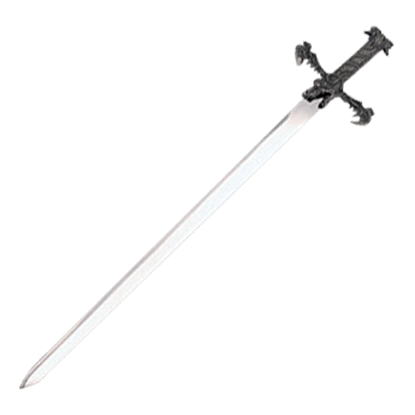 This decorative Colada Sword of El Cid offers superior finish and quality design. The blade is fabricated in stainless steel, with a bronzed finished hilt, providing a very attractive presentation. 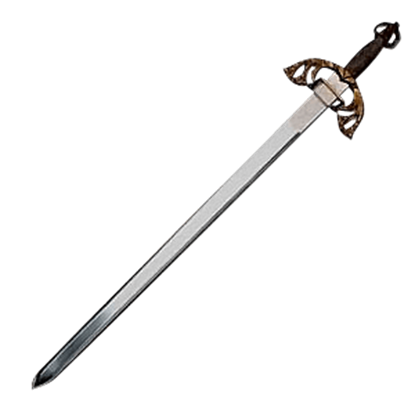 This is a smaller version of the SA3101 Colada, sword of the famed El Cid. At 30 inches long, it is perfect for a younger re-enactor. The fully-tempered stainless steel blade and the bronze-finished hilt require little maintenance. Excalibur is the Armaduras version of King Arthurs Sword. This small group of swords from Armaduras Medievales (SA3201 Excalibur and SA3223 Robin Hood) is intended to provide fully-detailed versions of famous swords at a lower price. This group of decorative swords from Armaduras Medievales includes models representing leaders and legends from medieval Europe. The Ivanhoe Sword is crafted in polished stainless steel, and its hilt is finished in bronze. This group of decorative swords from Armaduras Medievales includes models representing leaders and legends from medieval Europe. The Ivanhoe Sword with Scabbard is crafted in polished stainless steel, and its hilt is finished in bronze. 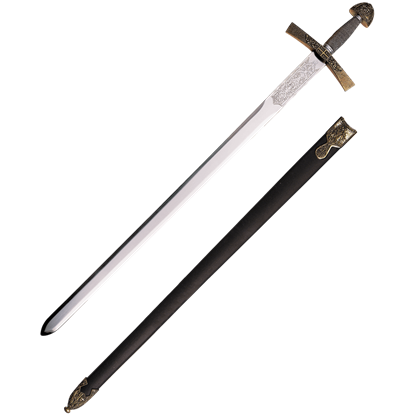 This Lancelot decorative sword is one of the models from Armaduras Medievales representing leaders and legends from medieval Europe. The Lancelot sword blade is crafted in polished stainless steel, and its hilt is finished in bronze. This Lancelot Sword with Scabbard is one of the models from Armaduras Medievales representing leaders and legends from medieval Europe. The Lancelot sword blade is crafted in polished stainless steel, and its hilt is finished in bronze. This popular Odin decorative sword from Armaduras Medievales comes from a group of models representing swords of leaders and legends from medieval Europe. The Odin sword blade is crafted in polished stainless steel.